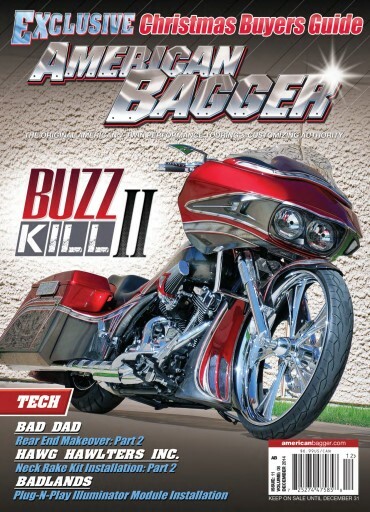 American Bagger December Issue. Inside you will find the Exclusive Christmas Buyers Guide. 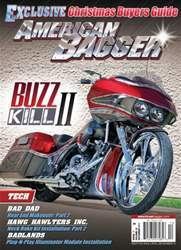 On the front cover is Paul Yaffees Buzz Kill 2. In the Tech section Bad Dad Rear End Makeover part 2, Hawg Hawlters Inc Neck rake kit Install part 2 and Badlands Plug-n-Play Illuminator Module install. 2015 Victory Motorcycle Line up. Events Street Vibrations, 2nd Annual Baddest Bagger Reno and the 2nd Annual Bikers Against Bullies USA Weekend.